Note, with all of these, it’s often OK to say “yes” to one of the kind of job, just to see. But you’ll probably find yourself saying no later on! Working for free. Caveat. If someone asks you to work for free AND they are an influencer who is likely to recommend you on AND they agree to give you a reference AND you’ve got time to do it without turning down paid work, then go for it. Doing something you feel uncomfortable about. It’s good to push yourself into new areas. That’s not what I’m talking about here. I’m talking about content farms or writing essays for students, if you’re an editor (see this article for more on this kind of thing), or anything on the wrong side of your ethical line. Just because you’re just starting out and you’re a bit desperate for work doesn’t mean you should go against your own morals. Doing something way outside your normal line of work. I think it’s a good idea to consolidate your reputation in one area and then branch out from there. By all means try something out, but if you don’t like doing it or it doesn’t fit, say no next time. Working again with rude, pushy or unreliable clients. If someone’s rude to you on the first job you do for them, or they don’t pay when they say they will, it’s OK to say no next time. You are worth more than that, and a difficult client now will always be a difficult client. Demanding, fine; rude and pushy, not fine. Don’t let your self-worth get undermined before you get started. Anything that will overload you. If you find yourself saying, “Well, I could fit this in if I don’t sleep on Thursday night” or “Well, if person x doesn’t send me their chapter on time I could do this”, it’s probably time to say no and recommend someone else. Small jobs that don’t look like they’ll turn into regular customers. Cruel but true – the smaller the job, the more noise to signal (admin to work) there will be. Pass the little ones on to your newer colleagues who need to build up their portfolio. Discounts. You should be experienced enough to stand by your pricing. You will have discounts worked out for various sectors (I give them to students and individuals) but at this stage, you shouldn’t be in the business of buying work, and that’s what this is doing. If your prices are fair, don’t offer discounts except in exceptional circumstances. Regular clients who don’t match your needs. Maybe they don’t pay well / on time or are difficult to deal with or have time scales that don’t match your own – sometimes it’s time to say goodbye and pass them on to another recommended practitioner. Any job with “danger” flags. To me, the main one here is “We’ve been through a lot of people and haven’t found the right partner yet” or “I’ve had problems with my previous editor / roofer / plumber”. By all means, check what the problem was. There are bad examples of every job out there, and you can be the one to fix the problem. However, if there’s an on-going pattern of problems, or they can’t be specific about what went wrong last time, my advice is to avoid. Any job where you need to spend a lot of time learning a new system or skill UNLESS you really do have the time to do that and it’s going to be useful for lots of work in the future. I have had to turn down jobs that involve learning a new kind of translation software recently – I knew I had time to do the work, but not to learn the software. Best to tell the client up front! 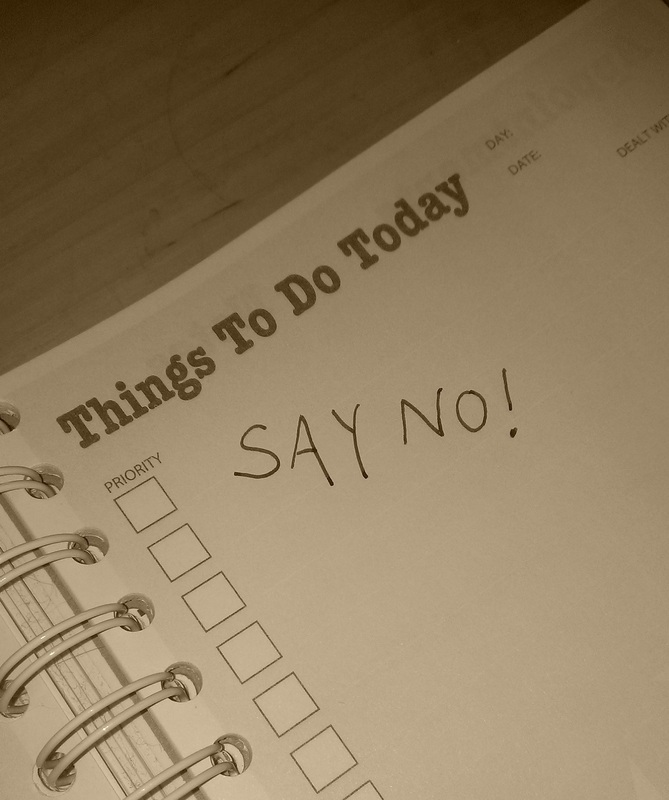 It’s great to say yes and it’s great to be busy – but it’s also vital to be able to say no and to be able to keep your busyness to a decent level. If you’re going through a dip in your mature business, go back to those early stage nos, and keep firm about them! Oh, and although I do say no fairly regularly, I do almost always refer the prospect on to a recommended colleague who might have the time / capacity / skills to help them better. Which makes it a win-win-win – the client will come away with a great impression of you, your colleague will have a new prospect, and you will feel reassured that you’ve done the right thing and not left them without any support. What do you say no to in your line of work? Have I missed any? What has been your experience of saying no to customers? What’s the best mix of customers? Yes, yes, yes!! This is so absolutely true, and such very good advice. As someone who has been freelancing for 12 years, there isn’t a single word in your post that I would take issue with – it’s all bang on-the-money. Thank you so much for this lovely comment – much appreciated! Very wise words indeed. I spent 8 years providing various freelance services and the “feast or famine” scenario — too much, or too little work — can be tough to manage. In my experience, good, regular, clients usually appreciated honesty when declining work if you really were too busy and could not possibly make their schedules. I would also say that for really large jobs do not be afraid to ask for a down-payment, some money up-front — again, good clients who know and value your work should not have a problem with doing that. Good cash flow is vital, of course! I was also very wary of anyone who clearly did not know what they were talking about, yet made very strong assertions that the work was simple, when it was not — trying to trivialize the skills/time required, pointing to future problems getting paid for your hours! I’m no longer in that area of work, but I certainly learned a lot of valuable lessons during those 8 years! Thanks for your comment, Graham. Yes, I think I’d better write about cash flow some time soon. I usually ask for immediate payment for a first job for someone / a company, followed by putting them on monthly invoicing in arrears if they become a regular. But with a very large job, I will ask for a proportion of the money up-front and maybe an interim payment. Feast or famine can be scary at famine times – but what’s more scary is taking on extra in famine time then drowning in the ensuing feast! Even though I can certainly appreciate this advice as a freelance writer, these tenets for refusing work are actually pretty universal for any self-employed person who offers a service. Many, many of us undervalue our skills because they may come naturally to us (although we may work hard just to develop that natural talent). But would you undervalue yourself if you were great at — say — computer programming? Now that I have been at this for so long, I can “sniff out” clients who fit much of the negative criteria you mentioned above. Thank you for a frank, concise article/blog that hits the nail on the head. Thanks for your comment, Dena. I certainly aimed the points at any self-employed person, so I’m glad that you can see that in them. I find a lot of people in our line of work undervalue their skills, so hopefully I can help to change that!